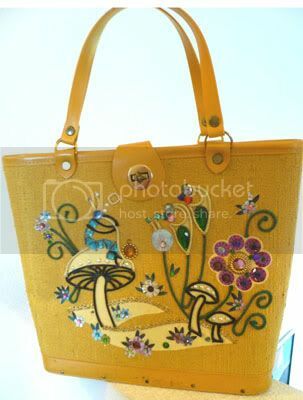 Magic Mushroom Kit Purse. Late 1960s. Maker: Unknown, possibly a General Crafts kit, put together by someone’s mom. Textured fabric tote-style purse with matching vinyl handle and accents in the unusual color of yellow—not discoloration, but the original shade. 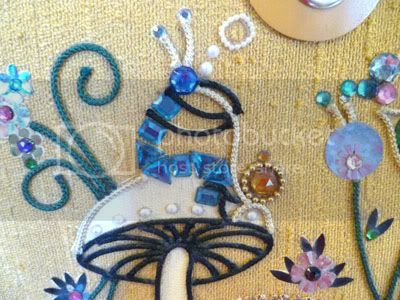 Pattern features a delightful motif with mushrooms and flowers, all done up in 3-D using an assortment of trims, faux gems, faux pearls and other sparkly geegaws (a real word, according to yourdictionary.com). Regular followers of this blog know that I have a ton of these kit bags, but what made me buy it was the fabulous hookah-smoking caterpillar. I’m not kidding. See close-up pic, below.